Concrete is a porous material. That means that water from below a concrete slab can contain a fair amount of moisture. The exact amount can vary throughout the year. Concrete moisture is a sincere enemy of epoxy floor coatings, so before you start thinking about applying that epoxy, take the time to find out just how much moisture is in the floor. Here are the two most common types of test for concrete moisture. This is a low-cost, low-tech moisture test that can be useful for determining if you have moisture in a garage or basement floor. It is not, however, the best test if you are planning to put an epoxy coating on the floor. Using duct tape, fasten pieces of heavy plastic or aluminum foil (about 20 inches square) to several spots on the floor. Check the squares every few days. If you find moisture on the bottom, you have moisture in the slab. Moisture on the top, more common in a basement, is a sign of condensation from high humidity in the room. Moisture on both sides means that you have moisture in the air and in the slab. A little moisture in the slab does not necessarily indicate a problem, as long as the porous concrete can continue to “breathe.” But it should serve as a warning against applying a solid coating such as epoxy that would trap the moisture in the slab . . . until it starts causing the epoxy to begin peeling. For a more accurate test, you might want to consider the next option. 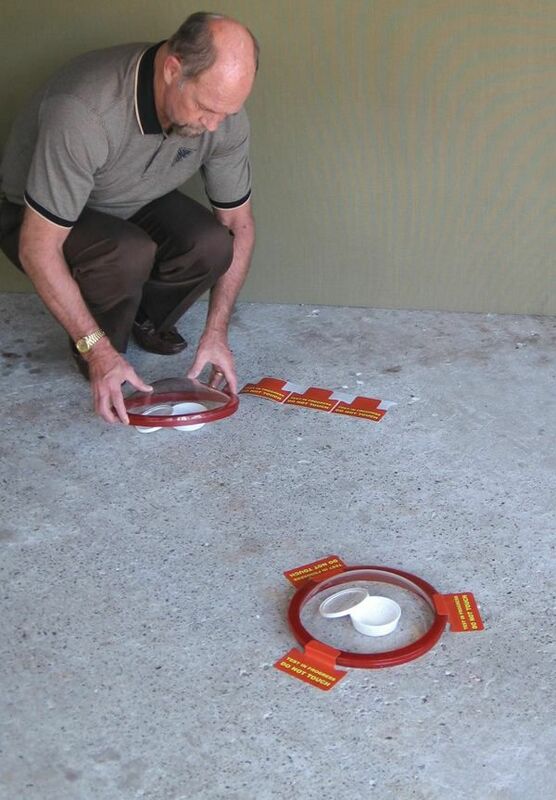 This is the test that professionals use before applying new floor coverings, and it is highly recommended before you go to the trouble of adding an epoxy coating to your garage floor. You may need to order your calcium-chloride moisture testing materials online (search for “calcium chloride test”). Once you receive your test supplies, follow instructions for preparing the floor. This may involve having to grind the surface and conducting a simple pH test. Then set the proper number of test kits (three, in a typical two-car garage, which should cost about $50 total) on the floor, as directed by the manufacturer. You will probably need to keep the testing kit on the floor for several days. Then return the calcium-chloride container to the manufacturer, who will test the moisture content and send you the results. If you find that you have more than three pounds of water vapor per 1,000 square feet, don’t apply epoxy to the floor. Instead, think about some other type of flooring, such as special floor mats or tiles, which will not be affected by the moisture level in the concrete. Or, if your heart is set on epoxy, and the result is not too much over the three-pound limit, consider contacting a professional flooring contractor for a more thorough test and evaluation.